Macbeth’s Weird Sisters: Reason or Treason? Were Shakespeare’s weird sisters real evil hags who seduced the newly-appointed Thane of Cawdor with ambitious promises above his station? If so, could they have been the reason why the brave warrior Macbeth murdered King Duncan? * Superstitious Jacobeans believed in magic, and would have readily accepted that Macbeth was genuinely bewitched. Satan was stalking the land in search of souls and his coven of witches found a good, brave man who succumbed to their temptations because he was also human. * If you were put under a spell, you had no control over your actions. Therefore, once Macbeth was in their power he could not prevent himself from killing the king. * The Malleus Maleficarum claimed that wicked women have been responsible for the downfall of great men since the time of Eve in the Garden of Eden. Macbeth was following in a long tradition of doomed heroes. * The three sisters first approach Macbeth. He does not initially seek them out. This implies that Macbeth was intentionally targeted by Satan, which makes him a hapless victim of evil. * Banquo sees the women too. They were not just a figment of Macbeth’s imagination. Or perhaps the witches were merely a convenient excuse? In other words, did they exist only in the mind/s of the central character/s – as a projection of ambition and desire – or as a psychological attempt to rationalize the ultimate treason? * If Macbeth was truly a good man he would not have been so readily tempted by evil. Satan picks targets who are easy to seduce. The witches were the excuse he used to explain away his actions. * The ambition to be king may have been seeded in Macbeth’s mind even before the witches appeared. It was common to come across poor wise women, gypsies, or cunning folk, who made a living from fortune telling. After the murder they were fashionable targets to blame for the deeds that Macbeth was destined to do. * Supernatural influences can be used to explain, excuse, and justify horrific acts on the grounds that they are outside of self control. In the same way that mass murderers claim to hear voices that make them commit their crimes, Macbeth blames the popular scapegoat of his (and Shakespeare’s) time. * If Macbeth was genuinely bewitched he would have killed without deliberation. But he questions his actions, later wrestling with guilt and remorse. Is this because he knows he has done wrong and fears being found out? * Banquo sees the weird women and also hears their prophecies, in which case he should also fall under their power. But he is content to let fate play out by itself and does not take part in any murders. I have always been fascinated by Shakespeare’s skill as both a writer and early psychologist. His audience would have accepted these characters as real supernatural influences (which means Macbeth was an innocent man duped by evil). But the bard also knew the human mind. In today’s psychoanalytical society we understand how criminals sometimes project their crimes onto external influences to escape from blame (in which case Macbeth would have been guilty of murder and treason). According to Roman and Saxon chronicles, the British Isles were once overrun with wolves. But a combination of deforestation and hunting virtually exterminated all traces of the Eurasian grey canis lupus by the end of the medieval period. At a time when wool production was the major industry, anything that threatened sheep farming was a serious public threat. So between 1066 and 1154, Norman rulers awarded land to official wolf-hunters, on the condition that they controlled the predators in their area. And as part of a plea-bargain to avoid execution, certain criminals could elect to provide an annual number of wolf tongues to escape the gallows. By Henry Vi’s reign, wolves were found only in Scotland, Wales, Derbyshire, Yorkshire, and Lancashire. But they lived on in the public imagination, and were often one of the familiars associated with witchcraft. Legend claims that the last English wolf was killed at Humphrey Head, north of Morcambe Bay, at a place that used to be called Lancashire Over Sands. At some time during the Fourteenth Century a royal bounty was offered for each wolf pelt captured, and during one of the local hunts Sir Edgar Harrington became separated from his companions and rode for the top of Humphrey Head to look for them. On his way through the forest he heard the terrified shrieks of a young girl cowering behind a rock, hiding from an enormous growling wolf. Taking his spear Harrington battled the wolf, rescued the maiden, and took her back to safety. Apparently, when her gratitude turned into love, the couple were married and they lived happily thereafter with a healthy batch of children. They put an image of a wolf’s head on their family crest and today lie buried together in Cartmel Priory, with a stone wolf carved at their feet. How refreshing to have a romantic tale about wolves at a time when they were generally associated with witchcraft and evil! When someone mentions Shakespeare’s witches we naturally assume they are referring to the three weird sisters from Macbeth. Yet around the same time as the Lancashire Witch Trials were taking place in Northern England, another sinister plot was unraveling closer to King James’ court. Ironically, it involved a nefarious character who moved in the shadows of Shakespeare’s own circle – a cunning man by the name of Simon Forman (1552-1611). 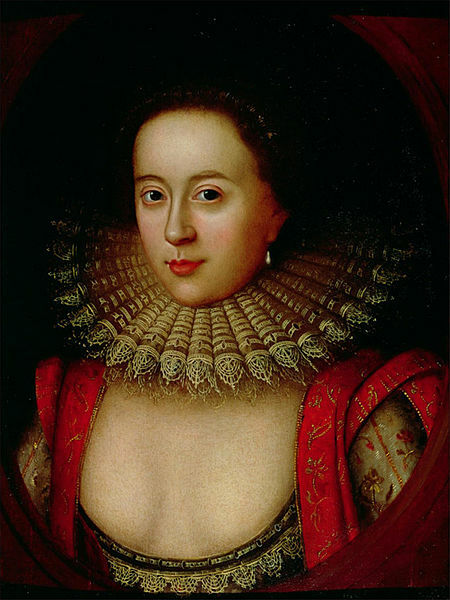 Two years after his death, Forman was implicated in the murder of Sir Thomas Overbury through his relationship with two former female patrons, Countess Frances Howard Carr (1590-1632) and Mistress Anne Turner (1576-1615). But Simon Forman was neither the fool nor evil magician that Stuart history suggests. Much more likely he was a self-trained quack whose chief sins concerned the numerous illicit sexual conquests he recorded in his diaries. Forman was a charismatic, intelligent seducer who dabbled in apothecary, astrology, and the occult arts. His clients included Emilia Lanier (possibly Shakespeare’s mysterious Dark Lady) and Mrs. Mountjoy, the bard’s landlady. Interestingly, Macbeth is one of the plays Forman mentions seeing at the Globe Theatre (April 20, 1610). Yet as Barbara Howard Traister’s biography comments, Forman appeared much more interested in the note-taking doctor than in the supernatural characters, which is intriguing for a man who had already been imprisoned on charges of witchcraft. Although Forman died in 1611, his reputation and influence lived on. He was accused of having supplied the poison that killed Overbury in a diabolical plot hatched by the two femme-fatales – Carr and Turner – and of providing the countess with the magical means to be rid her former husband (Robert Devereux) in order to win over the king’s favorite courtier, Robert Carr. At the center of the controversy stood Countess Frances, a virgin child-bride wedded to the Earl of Essex who had since fallen in love with the dashing Earl of Somerset. Frances wanted her political marriage annulled so she could marry her beloved, but Carr’s mentor – Sir Thomas Overbury – disapproved of this match and stood in their way. A plot was hatched to discredit Overbury, and he suddenly found himself confined to the Tower of London on trumped-up charges. Some years earlier the countess had apparently contacted Simon Forman for a love potion. It was stated at her trial that the cunning man also supplied her with a range of poisons, that were later mixed with tarts and jellies before being fed to the imprisoned Overbury by his jailor. He died in September, 1613. A few weeks later the Devereux marriage was officially annulled leaving Frances free to wed Carr. But over the following months rumors of the murder plot began circulating at court, finally forcing the king to pay notice and address them. Under the weight of the overwhelming evidence presented the countess confessed to poisoning her enemy, was found guilty at trial, but eventually received a pardon. She was released from the Tower in 1622, having served due sentence for her crime. Her accomplice, however, was not so fortunate. Anne Turner was rumored by some to be the illegitimate child of the conjurer, Simon Forman. 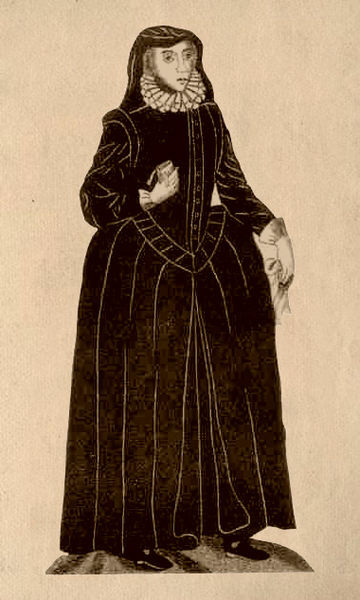 She was widowed from Dr. George Turner in 1610 and then became the mistress of Sir Arthur Mainwaring. Somehow or other she befriended the countess, perhaps in her capacity as a sought-after dressmaker. Anne held the patent for the saffron starch that dyed fashionable ruffs and cuffs yellow, a more flattering color for many complexions than the usual ivory white lawn. She was also an independent business woman who ran houses of ill-repute in Hammersmith and Paternoster Row. But because she was not of noble birth, the accomplice became the scapegoat for Overbury’s death. Anne Turner, convicted of being a whore, a bawd, a sorcerer, a witch, a papist, a felon, and a murderer, was hanged at Tyburn in 1615. She was sent to execution in her own fashionable yellow ruff, by a man wearing the same saffron ruff and cuffs – denouncing the color of her dye and putting an end to that particular fashion. Jacobean witches came in many shapes and guises! 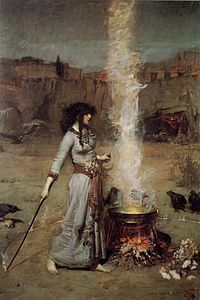 In Act IV – Scene I of Macbeth, Shakespeare’s three “weird sisters” prepare a “hell-broth” to produce a series of apparitions for Macbeth that set in motion a chain of deadly events. Written only six years before the Lancashire Witch Trials, this script provides a good insight into some of the magical beliefs of that time. The Jacobean audience believed that witches brewed such diabolical charms, and seeing this dramatic scene live on stage they would likely have been terrified, fascinated, mesmerized, and revolted by the disgusting ingredients – exactly as Shakespeare intended. But let us take a closer look at his recipe. The bard was not only a master playwright, he was also a shrewd psychologist who understood the minds of the masses who flocked to the London theatres. Therefore, it is not surprising that one of the first things thrown in the pot is the fenny snake, a nod to the snake who tempted Eve in the Garden of Eden. The Catholic Church claimed that all women were necessarily evil because of Eve’s transgression, and that explains why the majority of accused witches were female. The next three ingredients – eye of newt, toe of frog, and wool of bat – are added to the first item swelter’d toad venom – highlighting four nocturnal creatures that are often associated with witches and their familiar spirits. The liver of blaspheming Jew endorses the common anti-Semitic beliefs of that era, alongside the racial prejudices held against the Turk and Tartar. And Shakespeare further played into the beliefs of his class-conscious, biased audience by having a good man like Macbeth brought down by his scheming wife and a band of wicked hags. A country audience, however, may have interpreted Macbeth’s cauldron quite differently from the royal courtiers and city dwellers. Many of these exotic ingredients are actually poetic variants on the common names for herbs. Fenny snake = chickweed; Eye of newt=mustard seed; Toe of frog = frog’s foot or bulbous buttercup; Wool of bat = bog moss; Tongue of dog = hound’s tongue; Adder’s tongue = adder’s tongue fern; Lizard’s leg = ivy; Howlet’s wing = henbane; Scale of dragon = dragonwort; Tooth of Wolf = wolf’s bane; Hemlock root = hemlock; Liver of Jew = Jew’s myrtle or box holly; Gall of goat = St. John’s Wort or honeysuckle; Slips of Yew = yew tree bark; Nose of Turk = Turk’s cap; Tartar’s lips = ginseng or tartar root; Tiger’s chaudron = lady’s mantle; and the Finger of birth-strangled babe= foxglove, also known as “bloody fingers”. The remaining items – toad venom, powdered mummy, shark, and baboon’s blood – were all widely thought to have medicinal properties. But William Shakespeare was also a poet. He knew the magic of words and rhythmical power of his hypnotic witch chant. It did not matter that these characters may have been throwing armfuls of common hedgerow roots and leaves into a boiling cook pot. Much more important were the awful-sounding names that conjured up terrifying images in the minds of his audience – and at this he was an unsurpassed wizard! Foy, Catt. “A Witch’s Brew: Recipe by Shakespeare” in Witches & Pagans #29 (Oregon: BBI Media, Spring, 2014) pages 24-26. Throughout the Middle Ages,Lancashire was ripe with tales of cunning folk. 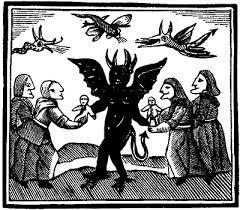 In 1595 a conjure man called John Hartley convinced the Starkies of Huntroyde that seven members of their household were possessed by demons. The Starkies were related to Roger Nowell, a Justice of the Peace from nearby Read who spearheaded the infamous Lancashire Witch Hunts of 1612. James 1st became King of England in 1603 – the same year Jennet Device was born into the Demdike Clan at Malkin Tower – and the same year that a terrible plague swept the land. Two years later Guy Fawkes’ Jesuit Gunpowder Plot failed to blow up Parliament, but it did trigger a nation-wide persecution of priests at a time when Lancashire was still a Catholic stronghold. Witches, ghosts, and boggarts were a part of English folklore, inspiring many weird and wonderful tales that included Shakespeare’s Macbeth (1606). The wise women of Pendle Hill worked the superstitious locals to eek out a meager living. They offered a wide range of services from basic herbal medicine to midwifery and abortion – concocting charms, curses, love spells, and potions – claiming they could heal, harm, and foretell the future. 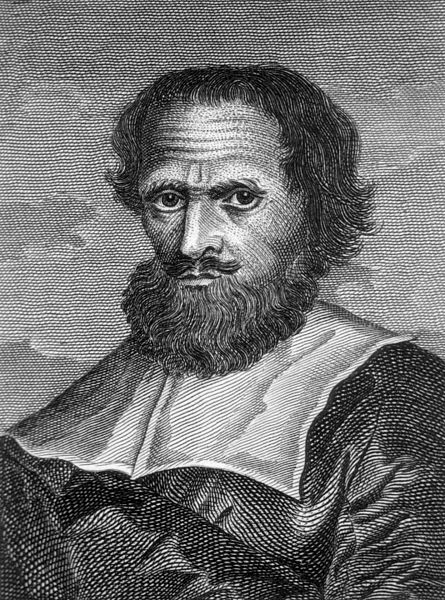 On March 21st in 1612, Old Demdike’s teenage granddaughter – Alizon Device – set off to go begging in Colne. On the way she met a peddler called John Law who refused to give her the pins she demanded and so she cursed him. Moments later Law collapsed, paralyzed down one side of his body. He pointed the finger at Alizon Device and his son went straight to the authorities. Because Alizon was one of the notorious Demdikes the rest of her family were rounded up for examination and before long, the Lancashire witch hunts had begun. Any one fascinated by Shakespeare’s Macbeth will love the question behind Mercedes Rochelle’s debut book: How do the sons of Banquo come to rule Scotland? 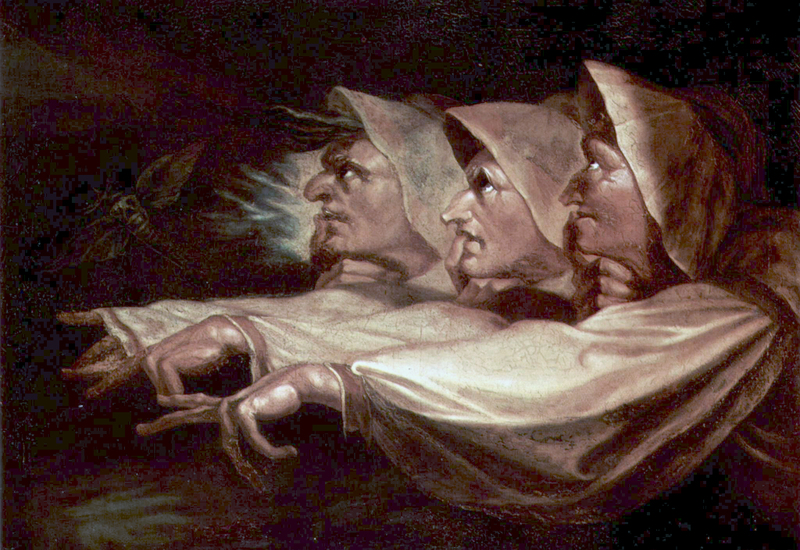 The three weird sisters tell Macbeth’s companion that “Thou shalt get kings, though thou be none” – a promise that sets in motion the deadly events of the famous play. Heir To A Prophecy (Hampshire: Top Hat Books, 2014) follows a fragmented trail through Scottish history – tracing the line from Banquo’s son Fleance to King James Ist of England – with a similar mix of fact, fiction, and supernatural interference as found in the original tale. We know that Banquo is murdered on Macbeth’s orders, but that his son Fleance escapes. In Rochelle’s version he goes into exile in Wales at the court of Gruffydd ap Llewelyn, where he woos and impregnates the king’s daughter, Nesta. Nesta bears an illegitimate son called Walter, who enlists in Harold Goodwineson’s service and ends up fighting at Dunsinane and Hastings. Along the way he befriends Prince Malcolm, King Duncan’s heir to the Scottish throne. Years later, Walter settles in Malcolm’s court and is rewarded for his services, becoming the first Steward of Scotland. This legitimizes his position, and prepares the way for future descendants of the royal house of Stuart. Rochelle’s portrayal of the three witches is particularly interesting. They appear at various points in her story to advance their original prophecy, but rather than being the weird old hags of Shakespeare’s era they are associated with the Norns of Scandinavian mythology – fates who control mankind’s destiny. But aside from this nod to the bard, Rochell wisely does not attempt to imitate one of the great literary masterpieces with a sophisticated, high-brow response. Instead she writes a plain, rollicking tale that should have broad appeal for those readers who like a fast-paced romp through history. This novel is nicely edited and presented. The setting, however, is too broad a time-period to examine and explore the various situations in any great depth. Heir[s] To A Prophecy could well have been a whole series, with each book focusing on one central character – Fleance, Walter, and so on! Hemlock has several names including Conium maculatum, Poison Parsley, Devil’s Bread, and Poison Hemlock. 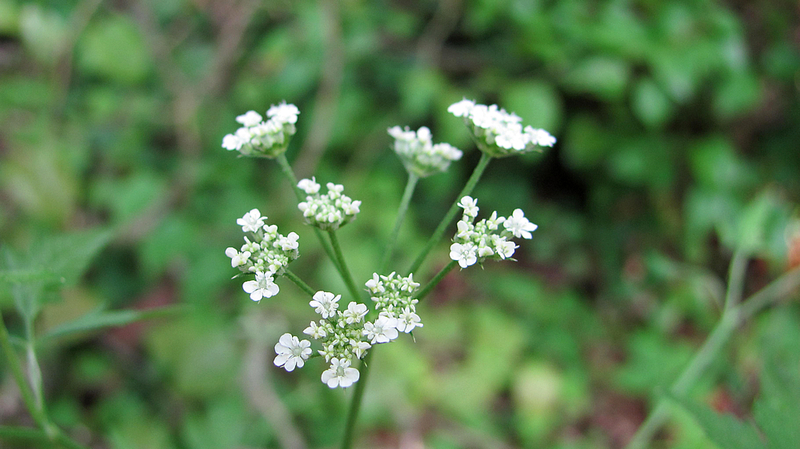 Conium comes from the Greek word konas – “to whirl” – because vertigo is one of the symptoms from eating this plant. Hemlock is a highly poisonous member of the carrot family. It also affects animals and can cause birth defects in pregnant mammals. All parts of this invasive plant are toxic, especially the seeds, but it is thought to be less harmful when grown in colder climates or when dried out. It grows small white flowers on a speckled stem that turns purple at the base. All parts are hairless. A flowering bush smells of mice, but the crushed leaves and roots are pungent like parsnip. Hemlock prefers warm, moist soil so it often flourishes alongside streams, ditches, and the edges of fields. The Ancient Greeks used hemlock to execute condemned prisoners, the most famous being the philosopher Socrates. In Shakespeare’s Macbeth, the three Weird Sisters add “Root of hemlock digg’d i’ the dark” to their magic cauldron – a sure sign they were up to no good!